More than 16,000 people attended this year’s 13th annual Hay Festival Segovia, Spain’s largest ideas event. September saw leading writers and artists from around the world converge on the UNESCO World Heritage site for more than a week to talk, think and create, covering not just the arts, but today’s leading issues, from politics to business. Supported by the IE Foundation, IE University was once again the main associate and academic partner. IE University’s historic Santa Cruz la Real campus hosted several of the most significant events. Among the big names from the worlds of literature, art, architecture and journalism at IE’s Segovia campus were Ken Follett, Kayuzo Sejima, Anthony Beevor, Hanif Kureishi, Stephen Frears, Paolo Vasile, Paul Preston, Simon Schama, Luis Rojas-Marcos, Scott Hartley, Guillermo de la Dehesa, Catherine Nixey, Isabel Coixet, Martha Thorne and Santiago Iñiguez, President of IE University. 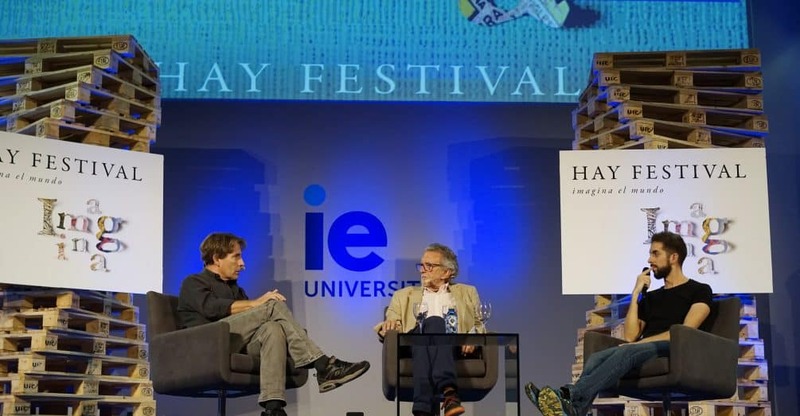 Hay Festival’s programming featured two panel discussions co-organized by IE University and FT Weekend, moderated by Tony Barber, FT Europe editor and Frederick Studemann, the FT’s literary editor. During the festival, leading issues in current affairs were analyzed, such as the US-China relationship, Catalan independence, media censorship, the rise of populist politics and Donald Trump’s impact. The festival’s 13th edition once again attracted record numbers with 97% of events sold out, among them conversations with Ken Follett, Isabel Coixet, Paul Preston, Javier del Pino, David Broncano, Iñaki and Aitor Gabilondo and Marwan, among many others.